Is Sedio Dilex Pro for the Iphone 6 and 6 Plus worth getting? We think so! This is a slim case from Sedio though they do say its protective with fancy words like HexGuard, this is not a substitute for tougher cases like the Ballistic Tough Jacket or Urbanite. Right off the bat, We’re big fans of this case even though our iPhone was damaged in a small 3ft drop off a bed. The texture of the case is really nice and the design of the case greatly improves the handling of your iPhone. The kickstand on the case works decently but only in one direction. Based on our time with this case, we gave this case a score of 4.2 Eh’s out of 5. This case is a great alternative to Apple’s Silicone case and you get much more for less money which is a win-win but if you’re looking for something tougher, then check out the Tech 21 cases or a Thule Atmos X3. If you want to see how this case compares against other cases, check out our comparison tool! Design – As thin as the Apple Silicone case but has twice the layers? In terms of design, this is a really thin case as it’s not much thicker than Apples silicone case but the crazy thing is that it has two layers to the case. The case fits well together and the back seems fairly scratch resistant which makes it wear a little better than other cases. Installing/removing the case is quite easy as well though we will note that there is a chance that the power button will not align properly so if that happens, take your iPhone and re-install the case. Protection – Hexguard does what? 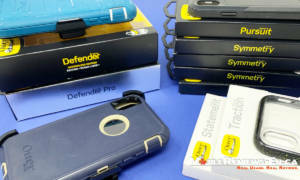 In terms of protection, the Seidio Dilex Pro isn’t going to provide much drop protection. Even from a low drop, the case didn’t do much to stop one of our corners from being slightly damaged. In terms of dust protection, the case won’t let dust and debris along the sides but the Apple logo on the back is exposed. For the iPhones touchscreen, the lips of the case aren’t very high so we definitely recommend getting a screen protector with this case. On our case, we had a Amzer Kristal edge-to-edge case and the Dilex Pro didn’t get in the way/peel off the screen protector. In terms of functionality, the headphone jack cutout will accommodate slightly larger jacks. The lightning part cutout will allow for larger cable types. Other than that, you can easily access everything on your iPhone. The Seidio Dilex Pro actually makes it easier to handle your iPhone as the cutouts and the texture of the case have been strategically placed where your fingers can easily find them. We’re big fans of this case because of that feature. Have questions about our Seidio Dilex Pro Review? Please ask them on our Google+ page or on our Facebook page. Another great review. I appreciate that you made sure the holster was shown in the pictures. Please add a section to your written reviews that says whether a holster is available for, or included with the case. On the SEIDIO website, I see that any case that has an available holster can be ordered with or without the holster. Also, just wondering if you are participating in SEIDIO’s reviewer rewards program? Here’s the link: http://www.seidioonline.com/Articles.asp?ID=334 I would love to see you review their CAPSA™ TouchView with Metal Kickstand Combo. Hopefully the CAPSA case is more protective than the Dilex Pro. I like that it includes a screen protector and has a landscape kickstand. If it’s as protective as the Atmos X3, maybe it will rise to the top of the pile. Still looking for the “perfect” 6+ case with holster. Thanks for the case suggestion and link. Seems like an easy way to get a case. Love all your test and comments. Great site! I am thinking of using this holster with another case such as the Incipio Duel Pro as in your video as it has better drop protection. What is the best rated case that would work with the Dilex pro holster? Would the Incipio Duel pro Shine work as well even though it is a little thicker? I’m not sure about the Shine…though it looks very similar in design to the DualPro.